Residence Le Palme is situated on a hill 500m from the beach. Within 500 meters., on the waterfront, you can find all kinds of shops and pharmacy. Ancona: the city is divided in two clearly separated parts: the old city centre and the modern part. Walking through the small streets and the steps of the city centre, it is possible to admire the wonderful views of the city, which is built around the port, and the astonishing romanic churches, such as "Santa Maria della piazza" and "San Francesco delle scale". Of particular interest is the romanic Cathedral of "San Ciriaco". At a distance of 13 Km south-east of Ancona, there is Portonovo. Here, at the bottom of Monte Conero, there are beautiful beaches of white rocks which dive into the sea. In this very romantic place there is also a lovely romanic church called "Santa Maria". 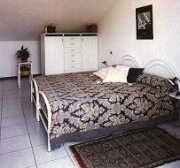 Composed of living room with cooking corner , a double bed (or sofa-bed) and one bathroom. All one-room apartments have a garden with private access. For 2 persons. Composed of a living room with cooking-corner and a double sofa-bed,on the mezzanine there are two single beds, one bathroom, a balcony and a garden with private access. 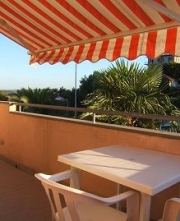 This apartment is on the first floor with terrace, a cooking-corner, double sofa-bed and bathroom, on the second floor there is a double room with toilet and a little balcony with sea-front position. For 4/5 persons. Ground floor: a living room with cooking-corner and double sofa bed. First floor: one double room, one room with bunk- bed and bathroom. All three-rooms apartments have a garden with private access. For 6 persons. BY TRAIN: You will arrive at Ancona station. There you should take a blue bus to Numana Marcelli. When you arrive to Marcelli, you can get off at the bus stop ask to the driver. When you get there you may call me. I will pick you up and bring you to the residence. BY CAR: take the motorway A14 to Ancona, go out to the exit Loreto Porto Recanati which is south of Ancona. After the exit turn right and after 200 m, arrived at a crossing, turn left for Numana Marcelli. Then go straight ahead along the shore, till you see a bridge. Pass under the bridge and immediately turn to the left then follow the road going up the hill you arrive at our residence le Palme. It is a pink building.